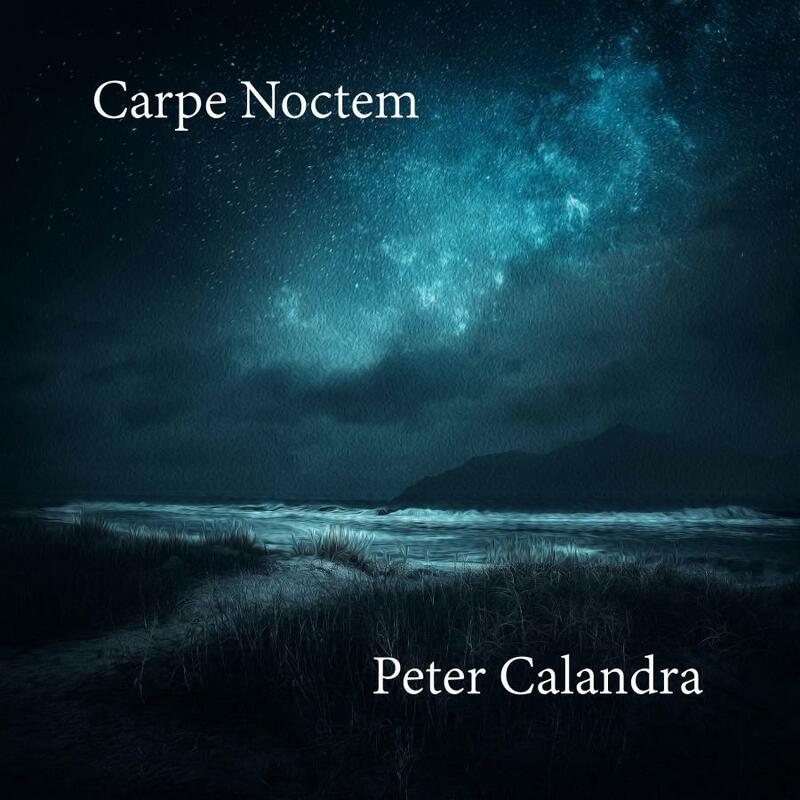 Carpe Noctem: an all-original new album of ambient, sacred, orchestral music by composer Peter Calandra. The prolific Film & TV composer reveals his passion for sacred-tinged orchestral music with choir in Carpe Noctem, available now. NEW YORK, NY, UNITED STATES, August 3, 2018 /EINPresswire.com/ — In recent years, Peter Calandra's wide-ranging TV, Film and Broadway music experience has expanded to include four original award-winning albums of ambient, contemporary instrumental, and new age albums. His latest work, Carpe Noctem — the fifth and most adventurous — heralds Calandra's complex talents in a modern approach to sacred-tinged ambient orchestral music that is sure to surprise and delight his listeners. The self-released album, 11 tracks in all, is available today via all major music sales and streaming sites; visit PeteCalandraMusic.com. When he sang with his college choir, the ensemble performed a lot of sacred music by the likes of Mozart, Bach and Beethoven, with the text in Latin. Calandra felt inspired learning and performing this music, and the idea to compose and record orchestral music with a choir has been in the back of his mind ever since. Calandra is a one-man band this time around, composing, orchestrating, sequencing and engineering the album, and even creating the haunting, impressionistic cover art of the beach at nighttime. Music critic Jonathan Widran notes that while Carpe Noctem as a whole is more universalist and spiritual than specifically religious, Calandra draws beautifully on some of the sacred elements of Christianity in creating these contemporary but timeless pieces. His opening track, “Agnus Dei” (Lamb of God) is titled after the invocation to Christ sung or recited during Holy Communion in several church traditions. It’s a majestic piece weaving percussive strings building in intensity, soaring choral voices and soul-stirring celestial atmospheres. It sets a positive vibe for what is to come. The title “Carpe Noctem” gracefully lends itself to a calming, meditational symphonic piece (with later choir elements) that eases through the senses like a floating dreamscape. The lovely dreams it invokes give way to a slow waking but beautiful morning (“Aurora Scandere,” i.e. Dawn Rising), whose stark simple notes, chiming tones, gentle percussive sway and ultimate action-packed orchestra indicate that the coming day will be a fateful one filled with conflicts and resolutions. The most overtly religious piece is the alternately beautifully solemn and buoyantly dramatic “Crucifixus” (The Crucifixion), whose bold horn textures and soaring chorus and orchestra swirl around the tragic event as if they’re angels with fore-knowledge that Easter and Glory will arrive soon. On the playful, lighthearted joy burst of “Ars Vitae” (Art is Life), Calandra uses a sweeping blend of strings, synth and voices to leap past the traditional understandings of divinity and share his own personal beliefs – that art is life and life is also art. This piece is influenced by the music of minimalist music pioneer Steve Reich and some of the harmonic material found in the music of Estonian classical/religious composer Arvo Part. Imbued with moments of starkness and quiet and intense symphonic expressions, “Illuminare” (Illumination) creates a thematic arc that takes the listener on a wisdom-imparting whirlwind from stillness to kinetic energy and back again – like an aural movie. The impression is that of soft reflective darkness gradually giving way to a feeling of illumination. Sometimes a triumphant spiritual life is only achieved after going through life’s many battles, a concept deftly and hypnotically illustrated on “Invictus Bellator” (Unconquered Warrior), whose swirl of dancing piano, haunting string, militaristic percussion and dramatic vocals flows like a soundtrack to a hard battle scene that ends with positive transcendence. The piano element here is one of Calandra’s most tuneful, but it’s the drums that really give us a sense of what it takes to get to that place where divinity takes over from the struggles of life. The divine space includes the beautiful morning trumpet notes that introduce “Mane Pacificae” (Peaceful Morning). There’s a stillness that fills the soul before the world awakes, but the recurring trumpet reminds us like an announcement that this peace is merely a break in life’s action. Carpe Noctem wraps with a trio of pieces that take us on yet another journey from serenity and reflection to a dynamic conquering of all obstacles and challenges. “Luna Benedictus” (Moon Prayer) is perhaps the album’s most serene new age piece, a gentle, moody meditation that serves as a quiet benediction to nature’s lunar phase. Filled with symphonic light and bright ethereal voices, “Sacrum Spera” (Sacred Trust) is a classically inspired piece that feels like a Mass for the angels. It was influenced by the Bach Cantatas, many created by the composer for church and sacred use. Carpe Noctem concludes with what feels like a sweeping plea for planetary healing via “Spiritus Mundi” (World Spirit), using ebb and flow styled sonic modulations of the orchestral elements to create a richly emotional tapestry that calls to each of our hearts, yet all at the same time. It ends the collection on a high hopeful note, full of energy, light and possibility – the perfect completion of an extraordinary 50-minute journey. For more information, visit the artist's official website at PeteCalandraMusic.com.